PLATEAUING SOYBEAN YIELDS are spurring research to find new ways to boost more bushels out of each acre. Researchers at Trent University are trying their hand at increasing soybean yields using beneficial bacteria to enhance plant growth. Still in the early stages, this bacterial research is targeting key plant development stages with natural growth hormones to enhance a soybean plant’s health, quality, and strength and increase seed size and pod numbers. “By testing and using carefully selected strains of bacteria, we’ve found a natural soybean growth enhancer that, with targeted application, can produce plant growth hormones that act as a nutrient vacuum, stimulating transport of metabolite building blocks to specific areas of a plant,” says Dr. Anna Kisiala, member of the research team. 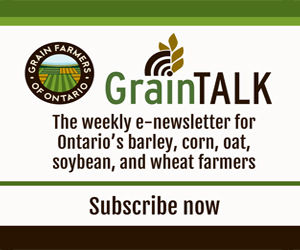 The research, funded in part by Grain Farmers of Ontario, is centered around cytokinins (CKs) — a vital group of plant growth hormones produced by the bacteria, Methylobacterium. Soybeans naturally produce these growth hormones and the research team believes boosting these key hormonal levels could lead to potential enhancements of soybean plant growth and development. Led by Dr. Neil Emery, vice president, research, and professor of biology with Trent University, the team has been testing and screening strains of the desired bacteria for exceptionally high CK growth hormone production and have been examining plant application methods to maximize these growth enhancements. In low amounts, growth hormones control a plant’s metabolism and control the overall development, or cell divisions, within a plant. By increasing the rate of CK growth hormones, delivered through the beneficial bacteria, and targeting application at specific growth stages, the research team expects more plant nutrients will be transported to those areas in need, improving processes like pod setting or seed development. The anticipated result will deliver increased soybean pod and seed size, leading to higher yields. In-field trial results from the 2015 growing season are still being evaluated. Preliminary results are pointing to a significant potential for greater soybean yields and enhanced overall crop quality as a result of applying the beneficial bacteria, Methylobacterium, and the growth hormones produced from this bacterial species. While the results of the 2015 field tests are still being evaluated, the research team has good reason to believe that the application of beneficial bacteria will result in increased growth hormone levels in plants and become a new tool for farmers as an environmentally friendly soybean growth enhancer. While more in-field research would be valuable to the project, the team is already talking about commercializing the bacterial strain. “This research demonstrates excellent potential for greater soybean yields and better crop quality — all resulting from applying carefully selected bacteria laden with growth hormones to soybeans when they need it most,” says Kisiala.